I am communication of universal wisdom. The mother of Mother Mary, Grandmother Anna was therefore the Grandmother of Master Jesus and Great-Grandmother of Lady Sarah. Her husband, Joachim, is also her twin flame, El Morya. Her history is that she delivered into this world a spiritual lineage that forever changed our world. She went through many initiations from the holy mothers to become the ultimate holy mother. She was highly devoted to her religious orders and practiced through prayer and meditation. Grandmother Anna works as the holy Mother, uniting the divine feminine with the blessed light of communication and expression to open up from the left-hand side of the embodiment that which has been suppressed in the 3D to open up into full expression of the divine feminine in the 5D reality of the internal infinite Love. 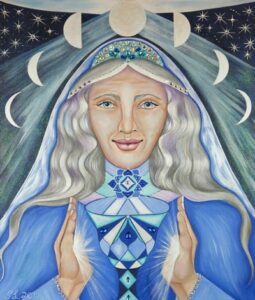 In the painting of Grandmother Anna the connection to the moon and the cycle of the divine Holy Mothers, opening expression and communication. The Holy Chalice in front of her connects to the opening of the divine expression of communication.